It might seem like I’ve just given it away but there is so much more to this “apocolyptic” fable. While the details are important what you come away with is the sense that you’ve encountered something archetypal. The details and the plot-line serve what is clearly a “meta-narrative”. You know there’s something deep informing the story when throughout the movie you are reminded of “The Road”, the Exodus, Homer’s Odyssey and as I said in the beginning, the plight of Israel seen through the eyes of a prophet. 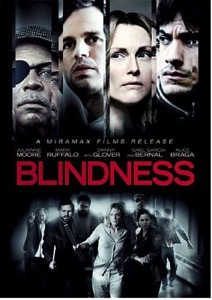 The usual ingredients of Hollywood apocolypic movies is absent from this movie and in my opinion “Blindness” is better off for it. You aren’t assaulted by special effects and explosions, there is no mega-hero outfitted in military garb saving the day for America, no pretty ending where the streets return to the order of the status quo and the epidemic or scurge that attempts to wipe out all society is not an excuse for gore. Rather the ailment that brings down society is really an ailment of the soul. Blindness is the presenting problem and you do see how, on the literal level, it makes life, as they know it, a misery but blindness is also clearly symbolic. The idea of what it means to have a vision in a world where no one can see is just one of the messages that ring through this cinematic telling. As well, themes of baptism and being washed clean, community, the remnant few, joy in the midst of sorrow all play off each other to make this movie more than just an “End-of-World” blockbuster. What makes a good movie great are often the little things that seem at first glance, tangental. Blindness blends dialogue that feels real and natural with cinematograpy in such a way that the end result is that the viewer feels part of the desolation, part of the blindness and in the end part of a much bigger story. It is a story that can only be told after the sorrow and the suffering. It is a story that a prophet long ago might have told anyone with ears to hear. What is the significance of the setting's ambiguity and the characters remaining nameless? What effect did the film's lack of visual color and odd camera angles do to you as a viewer? What is the 'white blindness' is symbolic of? What were the unexpected gifts of becoming blind? Some critics call the movie disturbing yet 'eye-opening'. Why is the movie eye-opening? The novel's opening inscription reads: "If you can see, look. If you can look, observe." Who suffered more? The blind or the sighted? The New Testament book of Hebrews states: 'Now faith is the substance of things hoped for, the evidence of things not seen.' Another translation: "Faith.. makes us certain of realities we do not see." How does 'Blindness' illustrate this truth? Why do you think the doctor's wife waited as long as she did to use force? Were her actions ethical given the context? "27, 5'4", black hair, brown eyes." "I don't want to know what you look like. I know that part of you with no name. And that's who we are, right?" What keeps us from living from this truth? All the characters undergo transformation, most clearly seen in the doctor's wife. How would you describe her transformation? What do you make of her expression in the final scene? How does the movie compare to other dystopian movies like 'Children of Men' or 'The Road'. What do we make of this increase in apocalyptic filmmaking? What small activities humanized some of the characters amidst the social chaos? What causes people like the 'King of Ward 3' to do heinous things? Is it fear, or something other? The theologian NT Wright talks about our true character in terms of what happens when we are under stress. What significance does this have in terms of the movie, and our own lives?